The letters from Tarzan fans turned the trick. 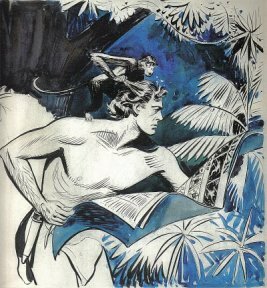 The big boss has agree with me that there is really a tremendous interest in our Tarzan picture serial story and has o. k'd an order for the sequel to "Tarzan of the Apes." Response to my request for letters and postcards from Tarzan fans was so great that I was just about able to bury him under the avalanche of mail. He almost had to yell for help but I gave no quarter until I actually saw his name on the dotted line of the contract to run the "Return of Tarzan" immediately after the present Tarzan picture serial ends. Including today's installment of "Tarzan of the Apes" there are two more installments or 60 in the entire story. 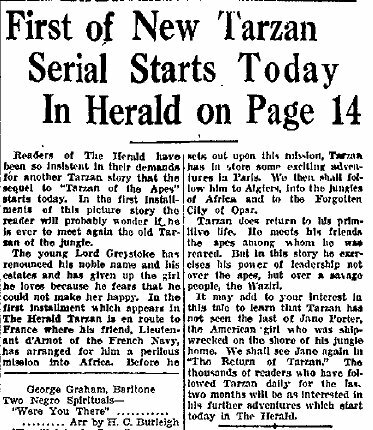 The final installment will be printed tomorrow and on Saturday The Herald will start the new serial so that Tarzan fans will not miss a single day in following the adventures of young Lord Greystoke. Believe me, this new serial "The Return of Tarzan," has even more thrills than the serial now running and if any of your friends haven't been following the present picture story make sure that they start with the new one on Saturday. 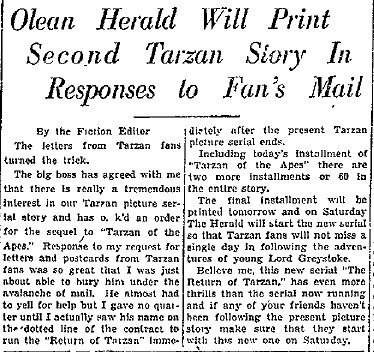 Olean Herald (NY) ~ January 4, 1930 Readers of The Herald have been so insistent in their demand for another Tarzan story that the sequel to "Tarzan of the Apes" starts today. 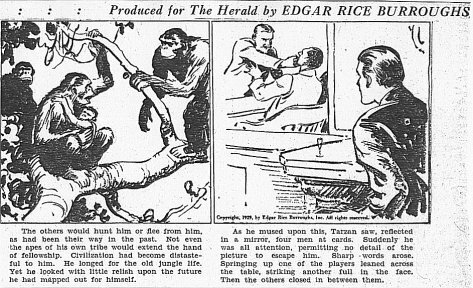 In the first installments of this picture story the reader will probably wonder if he is ever to meet again the old Tarzan of the Jungle. Tarzan does return to primitive life. He meets his friends the apes among whom he was reared. But in this story he exercises his power of leadership not over the apes, but over a savage people, the Waziri. 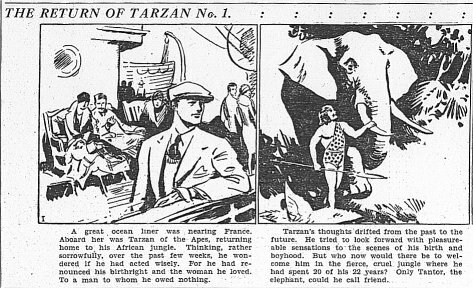 It may add to your interest in this tale to learn that Tarzan has not seen the last of Jane Porter, the American girl who was shipwrecked on the shore of his jungle home. We shall see Jane again in "The Return of Tarzan." The thousands of readers who have followed Tarzan daily for the last two months will be as interested in his further adventures which start today in the Herald.